Arm yourself with everything you need to quickly become an expert presenter. The Presentation Workout has been specially designed to help you perfect the art of presenting in any situation. Packed full of practical advice and easy-to-follow techniques, our 10-step improvement plan will show you how to enhance your skills and ensure you deliver a polished performance every time. Start your presentation workout today and begin exercising your full potential. 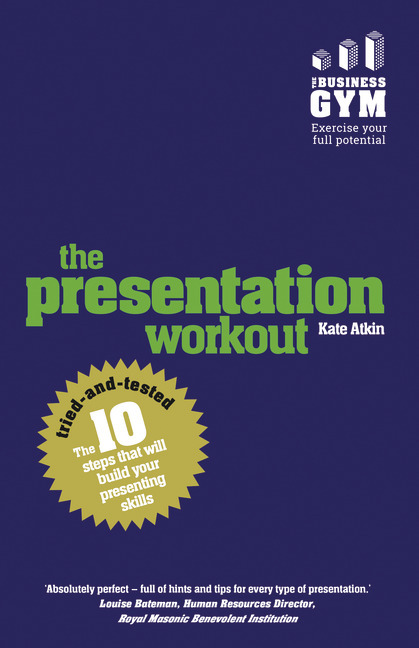 "Absolutely perfect – full of hints and tips for every type of presentation." "Brilliantly captures the tips, tools, strategies and techniques of how to become an accomplished presenter. A great read and it’s a book that I will be continually referring to!" "Easy to read and dip into as a lasting reference tool." Step 1 What is the purpose of your presentation? Challenge 1 How do I prepare with no time to prepare? Challenge 2 How do I fit it all in, with little time available? Challenge 3 How do I get people to listen and engage? Challenge 4 How do I get people to take action? Challenge 5 How do I manage interruptions? Challenge 6 How do I manage difficult people? Challenge 7 How do I deal with questions? Challenge 8 How do I handle nerves? Challenge 9 How do I remember what I want to say? Challenge 10 How do I make a boring subject interesting? Kate Atkin is an inspirational speaker, facilitator and author on Presentation Skills. Recognised as the Most Outstanding Trainer in JCI UK, Kate is also a World Debating Champion, number one Speech Evaluator in the UK and Ireland (2007) with Toastmasters International and European runner up in the JCI public speaking competition. Kate holds a Master of Applied Positive Psychology degree and is a regular speaker on the mindset needed to generate flourishing and confidence. She works with companies and individuals who wish to bring about positive change.